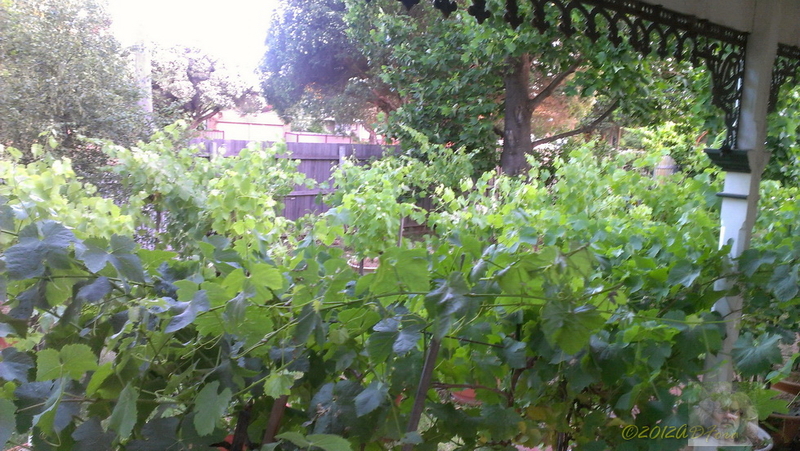 Two Fruitful Shiraz rows to left [east] and Pinot at right, barren Shiraz center. 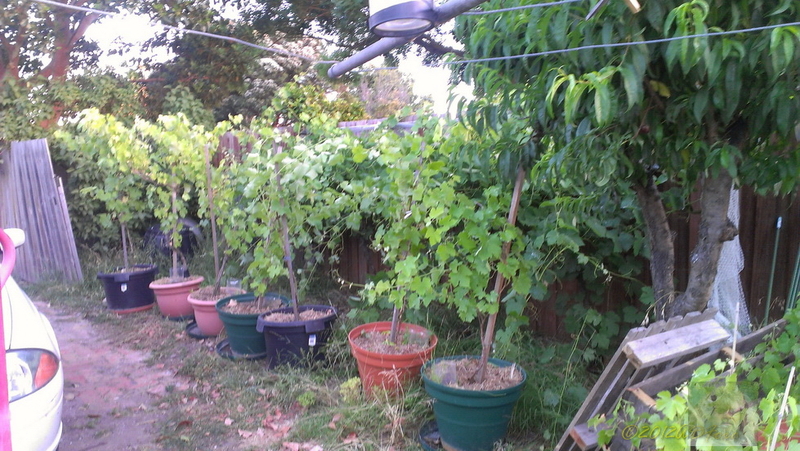 This week, the portable Vineyard has been rearranged, expanded even. Last years cuttings, and older ones too, have been re-potted. 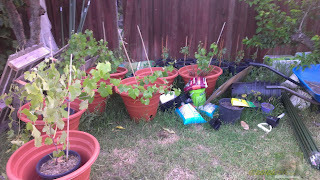 The nine Pinot potted vines are fruitful, mostly, but I think there will only be a liter or two of wine to be made- added as usual to the Shiraz. 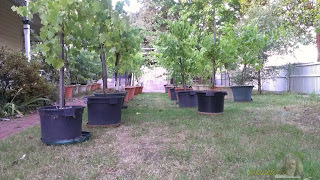 The four three-year-old cuttings are to be re-potted as soon as new mix is found, at a cheaper price! There surviving year old cuttings have been re-potted into small nursery size plastic containers, and arranged under a potted vine . It seems that the Shiraz, in the pots anyway, have not all produced fruit! 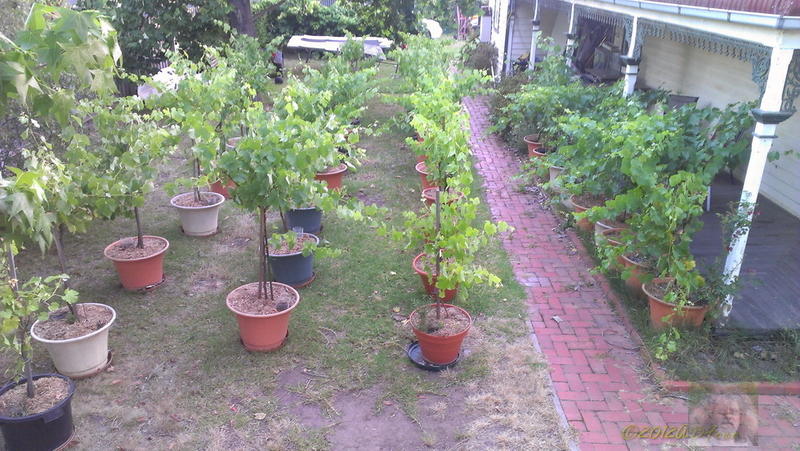 In fact, 18 are barren this year! 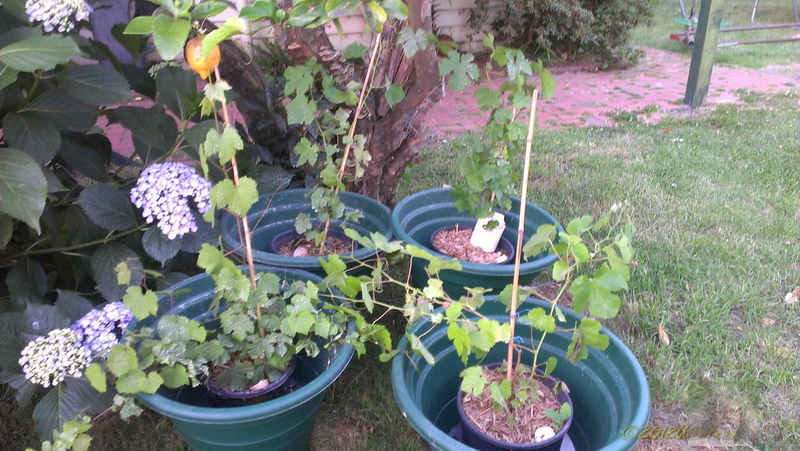 A three year old cutting was found to bear a bunch, so that was re-potted this week, so there are now 16 fruiting, as well as the original 6 planted vines. 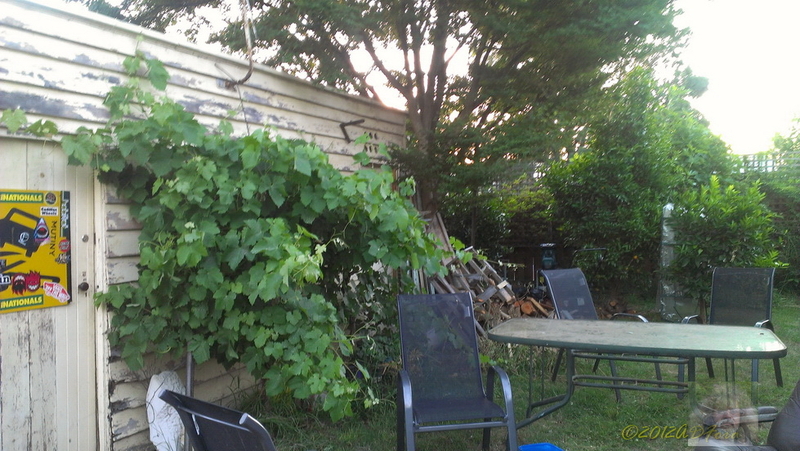 The pruning and re-arranging of the growth patterns of the potted vines- trellis wise- may have not been such a good idea now. 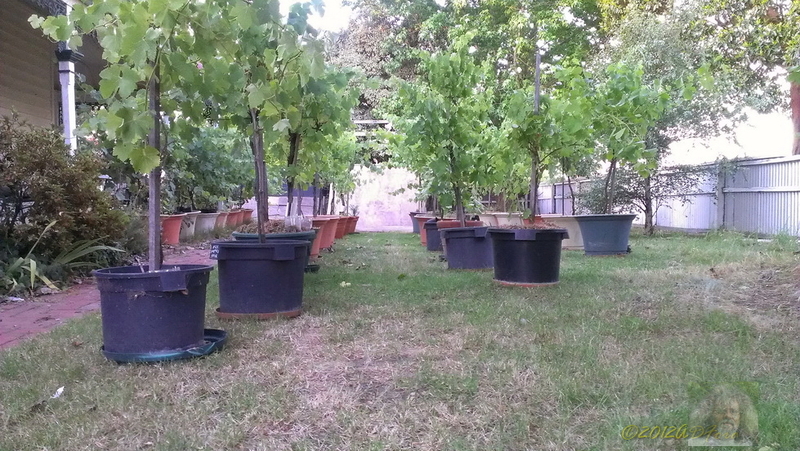 By not leaving two older canes in place, there is instead a profusion of canes, and not all with fruit. 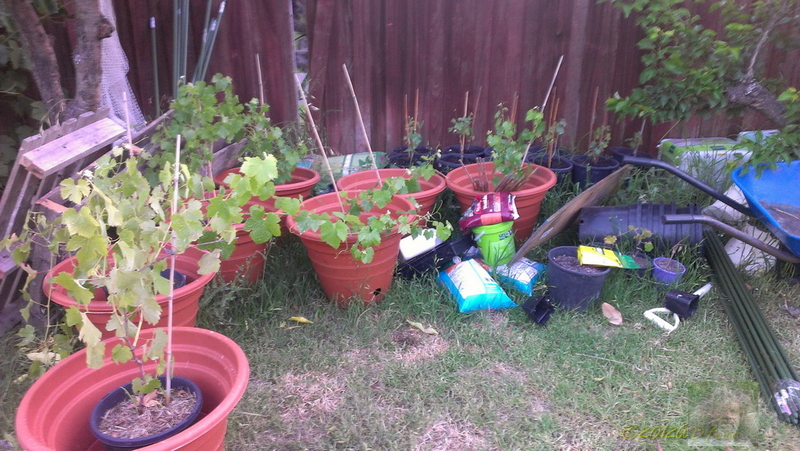 At least the orphans from Harry are going okay, some with bunches too. 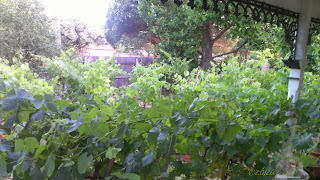 The Shiraz vines have been sorted into fruiting and non-fruiting. These are bountiful again, growing over the pathway, many bunches! Ideas of planting in the yard are stirring- not sure #2Son will like the idea of not being able to ride his quarter-pipe down the yard- but he does not use it that much anymore anyway.